Baltic Touring Car and Baltic Endurance Championship is the largest racing series in Baltic countries. 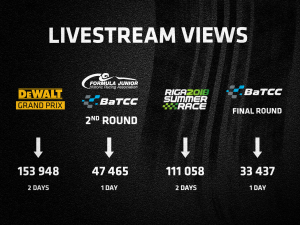 Our partners reach 1,2 million people every season with one racing series. 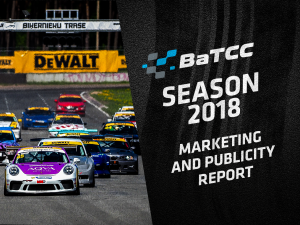 We invite you to get acquainted with our marketing and publicity report of season 2018. If you want to receive more detailed reports of each round please contact our marketing and communications manager Evita Tīdmane via e-mail: evita@batcc.eu. In 2018 BaTCC and BEC4H series consisted of 6 rounds, five of them were organized by LTD Venta Event and one – Estonian Grand Prix 2018 – by Estonian organizers. Please take into account that these reports does not contain data about Estonian Grand Prix 2018 event Livestream, publications etc. In 2018 we have reached 358 media publications all over Baltics (Lithuania – 76, Latvia – 233 and Estonia – 48). 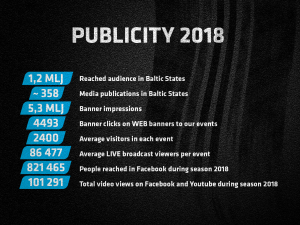 The main Livestream channels in 2018 were: Sportacentrs.com TV Channel (Latvia), mobile app LMT Straume (globally), Facebook (globally) and our media partners in Baltic countries – Delfi.lv, Delfi.lt and 15min.lt. Two of the events were livestreamed in full length and two more covered BEC4H races. It is planned to keep investing in Livestream coverage and grow the amount of viewers in the coming years. 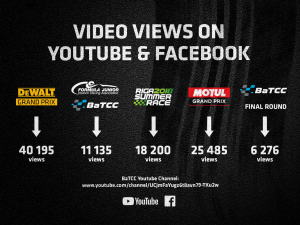 Total video views in Youtube andd Facebook in season 2018 reached 101 291 views. 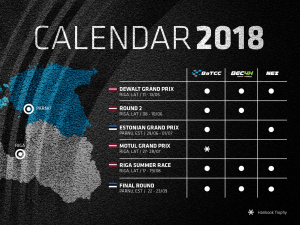 If you are interested in cooperation with Baltic Touring Car Championship, Baltic Endurance Championship or North European Zone 6H Endurance Championship series in season 2019 please contact evita@batcc.eu.